If you are planning to wear your favorite dress for an important occasion, but it does not fit you perfectly, then you are sure to get disappointed. You have to lose a few extra pounds to fit in to that dress. Banana-milk diet is an excellent option for losing weight easily and effectively. It helps you get positive results within three to four days. Does Banana and Milk Diet Work? The banana-milk diet program was first developed by Dr. George Harrop in the year 1934. This diet plan helps in making your body consume lesser calories and at the same time remain healthy. When you follow this diet, you are required to consume 2 or 3 bananas and one cup of fat-free milk for each meal. You can have the bananas after or before you have your milk. You can also combine milk and banana together to make a banana smoothie and consume it. It all depends on your preference. Another thing you have to keep in mind when you take this diet is to drink lots of water. By following this diet you can lose the excess fat that has collected in your body and also the muscle mass. By following milk and banana diet, you will consume lesser than 1000 calories per day. As a result, your body will be able to get rid of the extra pounds easily and fast. Each banana contains about100 calories and one cup of milk will not contain more than 80 calories. So, when you consume bananas and milk three times a day, you take I only about 900 calories. Bananas are loaded with nutrients and are full of vitamins and minerals, especially potassium. One banana contains about 422 mg of potassium in it. This mineral is essential for the body to perform all its functions normally. Banana is also rich in fiber. One banana contains about 3 gm of fiber in it. Fiber can helps body get rid of toxins that get collected inside. Bananas also give you a satiated feeling. So you will feel full for a longer time and will not feel hungry immediately. Banana is also a tasty fruit and this makes it easier for you to consume it. Fat-free milk should be an important part of our daily diet. It is a rich source of calcium and protein and does not contain any fat. The calcium present in milk is very beneficial for the body. It helps in the proper development and of bones and also makes your bones strong and healthy. It is also needed for the normal functioning of the hormones. Milk is also a rich source of proteins, which are very essential for the normal functioning of the body. Proteins help in the development of body muscles. When you take banana and milk combined together, your body is supplied with enough amounts of proteins, fibers, vitamins and minerals. At the same time, you are saved from consuming any fat, as both bananas and fat-free milk are devoid of fat. The nutrients that you get from this diet have the ability to supply your body with sufficient energy needed for you to sustain for a period of 3 or 4 days. When you get on this diet, you may feel some weakness initially, as the calories that you take-in get reduced incredibly. You can manage this difficulty and soon you will get normal. But in case it gets difficult to manage this situation, then it is advised that you consume one proper meal per day. Make sure that the intake of fat for this meal is less. Women during their menstrual cycle are advised not to take banana and milk diet. This is because this diet is not able to supply your body with iron, copper, zinc and some vitamins that are essential for the body during these times. But if you have no other choice but to take this diet at this time, then you must remember to have some vitamin and mineral supplements along with the diet. This will protect you from weakness and keep you healthy. You should not follow the banana and milk diet for more than 4 days in a stretch. This is because this diet lacks some of the vital elements required for the body. Following this diet for four days can help you lose as much as 4 kg of your body easily. If you want to lose more weight, then you can take a break of about one week and then again follow the banana and milk diet for 4 days. 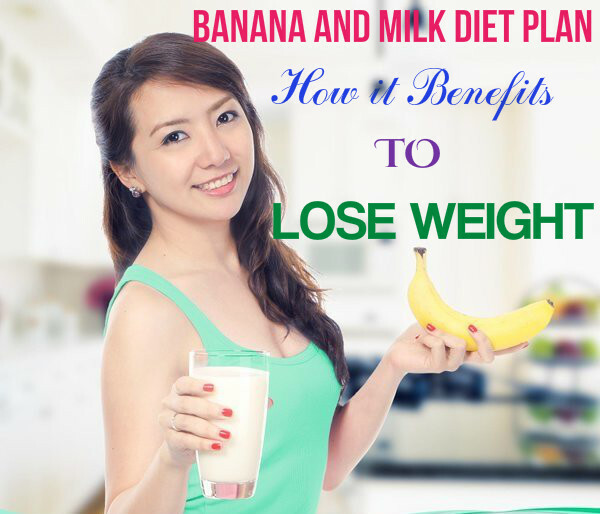 How to Follow Banana-Milk Diet Plan to Lose Weight? Breakfast: For breakfast you can have 2 bananas and one cup of warm milk. Mid-snack: drink three glasses of water for mid snack. Lunch: take 2 bananas and 1 cup of milk for your lunch. You can prepare milk shake by blending the bananas and milk. Mid-snack: Drink 3 glasses of water. Dinner: 250 ml of milk and 2 bananas. You may have them separately or make milkshake and consume. So, try out this diet plan and reduce your weight within days.